This post is about the Almighty Guest List....After the budget, the Guest List determines everything else and so they go hand-in-hand. It is one of the most important EMOTIONAL decisions you'd make in your wedding planning. It may even make you reconsider making a lunch break trip to the Justice of the Peace. The process of putting together the guest list is one of the most contentious issues for brides and often creates friction not only between couples and but between the couple and their parents as well (especially if you're Nigerian or Indian lol). Creating (and managing) my guest list was a constant hassle, up until the night before the wedding for a few reasons. First, I really wanted to limit the guests in my wedding to people who genuinely loved and cared for G and I and who I would look at photos 10 years down the line and still appreciate that they were there that day. I wanted to look out into the crowd that day and have no question that the smiles I saw were genuine. I did not want my wedding to be a community show-up and show down. I wanted an intimate event that I would value for the rest of my life. Second, I was having my reception at a hotel and was paying per head. Third, I had a lot of guests coming from Nigeria and London, so the number was constantly changing. Third, both G and I we are from pretty big Nigerian families. Boy, was I glad when I sent off the final Guest List- never to be dealt with again. The first thing that you need to do is sit down with your fiancé and determine the number of guests you'd like, based on your budget. Do NOT assume that you are both on the same page on its issue. It won't be pretty if you ignore and realize a bit too late that you want a "big" wedding while he wants something more intimate. Talk it out and if you differ, find a middle ground. 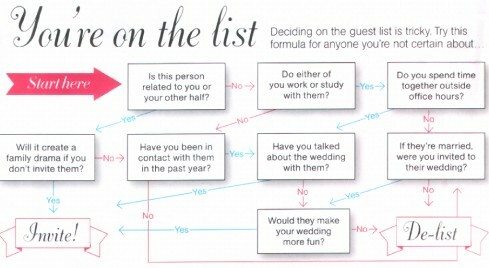 This is especially important early on because the guest list sort of determines almost everything else in the wedding. It will help you determine a reception venue, budget, etc. When you're negotiating with vendors, they will first ask you "how many guests are your expecting?" Practically, It may take a little while to determine a good number. But the best way to do this is to each jot down names of people you'd like to invite. Categorize them in groups and according to priority. While this may not sound so "nice" to have to prioritize people, it IS a necessity, unless you are willing to have a wedding for the masses. A- "Staple" Immediate Family members including Parents, siblings, Grand parents, close cousins, Aunts, uncles, closest friends (the ones you can't imagine your special day without), close in-laws, the bridal party, and of course spouses of members of the bridal party. D- Distant cousins, parents' other friends, neighbors and everyone else. On a regular day, would I feel comfortable taking this person out for a meal that cost me $100? Can I imagine having dinner with this person one on one? How much value has this person added to my life? How much has this person contributed (emotionally, encouragingly, financially, etc) to the person I am today? When last did I speak to this person? when last did this person even ask how I am doing? Years from now, when I see my wedding photos, would I want to see this person in them? When I was putting together my list, I was lucky enough to have three older siblings who already had weddings. That meant that I could use their guests lists to my favor. I asked each of them for their guest lists and used that as my starting board. I copied the names and addresses of "staple" family members and mutual friends. 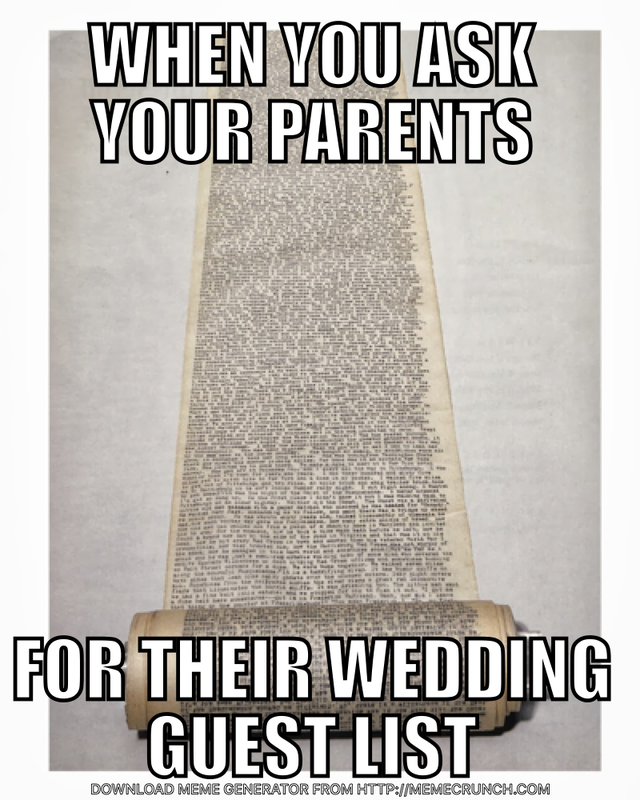 If you have a sibling or close cousin who did a wedding recently, you could ask for their guest list. It will save you so much time, and energy that you'd have used to ask for addresses and eliminate the chance that you'll forget about Aunty Liz who lives in Montreal. It would also help to sift through Facebook friends list and phone contact list, to make sure you're not missing anyone. This is something a lot of couples struggle with. When deciding whether or not to include kids in my wedding, I considered three issues: 1. Time of the wedding 2. Cost 3. Because they are Kids. For these very reasons, my decision to not include kids (besides those in the bridal party- direct nieces and nephews) was one I decided very early on. First, I was having an evening wedding which involved dinner. My wedding reception was scheduled to last past midnight and past many kids' bed time. As such, it was easy for me to exclude kids- I reasoned that the parents could use the night off to drink and dance, without anyone worrying about tending the needs of their kids. Second, there was also the issue of cost. A lot of reception venues, mine included, charge per head. More so, the prices are fixed, regardless of whether you include a 3 or 30 year old on the list. This meant that to include kids on my list, I needed to add at least 50-100 more seats, considering most of my 400 guests had an average of 2 children. Decision made easy. Lastly, there is the common knowledge that kids will be kids. Anyone who knows me knows just how much I adore children. However, they are still kids and would act accordingly. Before mine, I had been at weddings with kids and my general opinion was that most times, it was rowdy. I've been at three (3) different weddings where a child started crying or making a fuss in the middle of the vows. 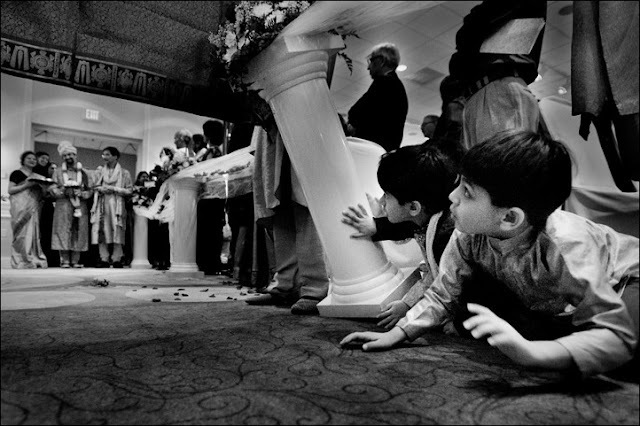 Once, a 2 year old ran to the altar and pushed down some decorations along the way, creating a mess. As selfish as that may sound, I wanted an intimate ceremony and did not want interruptions in my photos or videos. And if you decide to exclude kids, make it clear in your invitation AND call those you suspect may have difficulty with this. Just say, "I was just calling to make sure you received our invitation. I would love to have you join us but I just wanted to give you a heads up so you can find a sitter. I hope you understand." Again, nice, fair and FIRM. An alternative is that if you have a good number of children you'd like at your wedding, you can hire baby sitter(s) to watch the kids at a separate room close to the wedding or in one of the hotel rooms upstairs (if the wedding is at a hotel). My sister did this for about 20 kids at her wedding. I did this as well but only for the kids that were in my bridal party. Regardless of the scale you decide to do this, it could be a perfect alternative because the parents could enjoy the wedding but also check in on their children periodically. The parents were even more than willing to pay for the baby sitters. Regardless of the vision you have for your wedding, I bet you it is no match for the vision your parents have for your wedding. Most parents envision your special day (and all the guests in attendance), even before you attend your first day of high school. This issue will show its face severally in your wedding planning....but the first time you may face it head on is when you ask for and receive your parents' guest list. 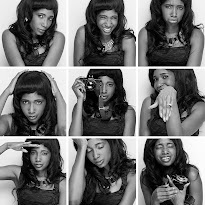 You may want a 100-people wedding but your parents want to invite that lady that watched you once when you were 1 year old, a coworker whom you've never met but to whom they've shown your photo and raved about your accomplishments, their neighbor's uncle who saw you once and commented that you are beautiful, and an old classmate who they ran into at another wedding recently and who said they "heard" their child is getting married. The latter is true story for me. My mom ran into an old classmate just around the time I got engaged. He mentioned that he "heard" her daughter was getting married and offered his congratulations. In "Nigeria-speak", that's language for, "you better invite me to come and chop rice". When I saw the name, which I didn't recognize on the guest list, I asked her and she said it felt awkward not inviting him, since he mentioned his willingness to attend and catch up with all their mutual friends who will also be at the wedding. I was very reluctant but I conceded (because you have to pick your battles, right?) I sent him an invitation and he RSVPed for one. Three weeks before the wedding, he emailed me telling me that his "lady friend" will be in town at the time and that he will come with her. He also offered to pay whatever it will cost me to add her to the list. Take note- that to brides, while money is a big issue, there's also the bigger issue of not wanting strangers at your wedding or in your wedding photos. I kindly responded that the guest list was closed, that we had finalized with the reception and vendors and that I already went over with my budgeted guest list. He did not respond. I heard later that he still showed up with his "lady friend" and when he could not gain access, caused ruckus at the door. He eventually entered and "chopped rice". Needless to say, when I took a log of gifts later, there was none from him. I should have said no from the beginning. 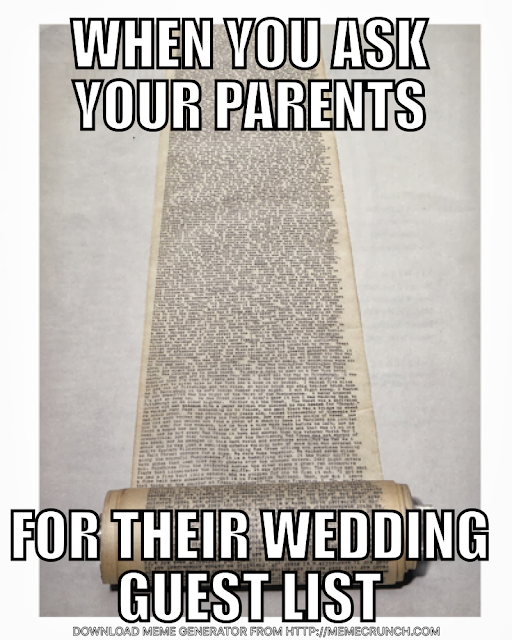 If your parent doesn't drive you crazy with their guest list, you are very lucky. The thing a lot of parents don't understand, especially immigrant parents who are not used to the way weddings are organized in the United States, is that every wedding cost is charged per head, period. In Nigeria, for example, weddings are free for all and food is cheaper so you can order for everyone. Unfortunately, unless you want to have your wedding in an open soccer field and don't mind not be able to personally interact with your guests, we don't have that luxury here. After you explain to your parents just how much the wedding is costing you per head, you can do a few things to ensure our relationship with them is still intact. Remember, the wedding will come and go- so ensure your relationships with the people you love survive the storm. You can allocate a definite number of seats for your parents and let them bring whoever they want within that number. ut of course, if your or your fiancé's parents are paying for the wedding, this may change the situation just a bit. In that case, you may need to find an equitable way to account for or better still, show appreciation for who is bringing in the big bucks! Also, as with any delicate situation, Pick your battles VERY wisely. Stay calm, polite but FIRM in your decision- refuse to be emotionally blackmailed. For my wedding, I excluded new or casual boyfriends and girlfriends. Needless to say, a lot of single people were not delighted, to say the least. One of my guests cancelled out the "typed" number of guests allowed on his invitation card and added his girlfriend (oh yea, this happens). Another, asked me to bring a date 2 weeks before the wedding and when I politely declined, he tried to sneak her in, then got mad when my wedding planner refused her entry. A cousin of mine told me she wouldn't attend the wedding, if she couldn't come with her best friend, so I politely took her off the list. So much drama. For nothing. I understand that until you plan a wedding, you don't know the sweat and dollars that go into it. But if you are a single guest reading this, please put yourself in the shoes of the couple and try to be considerate. If you genuinely care about the couple, the fact that you cannot being a plus one should be the least of your worries. Go, because you care about them. If you can't stand it, then just send a gift and stay home- no hard feelings. And if you are reading this and you are the bride or groom inviting a single person, be considerate as well. Make an effort to communicate the reasoning to everyone who is not allowed to have someone to accompany them. Be nice, polite but FIRM. No matter where you draw the one, stick to it. This is simple. Although not apparently related to creating your guest list, it WILL jeopardize the guest list you are trying to create and maintain, if not handled properly. Unless you want to attract strangers and undue pressure on yourself, do not over-publicize your wedding date. Engagement photos are great but I would not share the wedding date and I would keep the daily count down to a minimum, unless you are or plan to invite every single Instagram follower or Facebook friend. If you cannot invite them, try not to rub in their faces, and then get upset when they want to crash your wedding. Of course, the news of your wedding will spread and there's nothing wrong with posting pictures or expressing excitement. I did that because I was genuinely excited. And regardless, if your wedding is at a popular area, there will be crashers. All I'm saying is, keep it in mind and do not over-hype. Leave that for the club night promoters. In choosing people to add to your guest list, there will be people you struggle about. When it comes to people you're on the fence about, I would say air on the side of inclusion but seek counsel from someone who has planned a wedding before. For example, you may worry about those who invited you to their wedding but your relationship has faded since then. For me, I had my sisters to look to for advice and I invited everyone who invited me to their wedding, except one but that was because in that case, "faded relationship" was an understatement. You may also be on the fence about people who sent early wedding gifts before the invitations went out. In that case, there is no obligation to invite them, UNLESS you can "afford" to. Another on-the-fence issue is when dealing with distant cousins or family friends with large families. You have to consider whether to just invite one (who you are close to) or the whole family. This issue, I'd say, largely depends on the dynamics of the situation. If you want to invite only one, just consider the message you want to send and be sure to stick to it. You may also be at loss on whether or not to invite co-workers. Unless one or two are friends wit you outside of work, you either have to invite all members of your department or none at all. As for your boss or manager, consider the office environment- is there good rapport? Do you work for a small organization? Also, consider the nature of your celebration- are you having an intimate wedding or is it a large affair? If you are having a large affair, air on the side of inviting the boss, at least. But if it's intimate, just nicely hint that you are having a very small wedding. They should understand. Be careful about the message you send, before you send out invitations. Don't send a "save-the-date" to anyone who you are not sure you want to invite to the wedding because by sending the save-the date, you have virtually said, "Check this date off your calendar. I will be inviting you". I really tried to manage expectations prior to sending out the invitations. I remember a distance family friend sent me a message about how he had to take off work for my wedding and so, I needed to hurry up with the invitations so he could give his managers ample notice. Even though his concerns were logical, he already had an assumption that he would be invited. I simply responded thanking him for reaching out and explaining that we were still in the process of finalizing the guest list. I made one mistake though. When I was doing my initial compilation, I asked a distant family friend for his address which he gladly sent. Unfortunately, when it was time to finalize the guest list, for cost-reasons, we had to cut him and some others out. Even though I never sent as much as a Save-the-Date to him, he was offended that I even asked for his address. I genuinely felt bad, but at that point, I had already gone over my life by 70 guests and was only seeing dollar signs :-/ So yes, don't even ask for a person's address, until you are sure they will make the list. The last tip is practical. To make things easier for you to manage, use excel or a wedding guest list template/app on your iPad or phone. Being able to easy change the guest list will be very beneficial in the long run, considering, for e.g. If you are at work or at a cake tasting when you learn that Aunt Becky and her 3 sisters can't make it, you can easily go to your guest list and make the necessary adjustments and possibly, make a note to invite 3 other people. It's not enough that making the guest list is undoubtedly overwhelming, managing it may be more so. 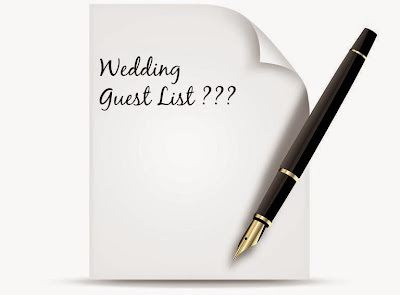 The guest list is one of the most dynamic aspects of wedding planning. Because of life changes and unexpected events, guests will drop in and out up until 2 days or even the day before the wedding. Having an easy and accessible way to keep track of the Save-the-Dates/ invitations sent out and the RSVPs will save you a whole of stress. For me, I used excel and was able to manage it on my iPad. Hit me up on dearnwavic@gmail.com and I'll gladly send you a template. As a bonus tip, send out invitations in batches, based on priority (see above). Maintain a back-up guest list for those who don't make the original batch. No matter how beautiful and special your wedding day will be, not everyone you invite will be able to make it for numerous reasons: cost of travel, work, something going on their lives, a scheduling conflict, or even one of your rules. So, you have to be on top of your list in a way that as soon as you find out someone can't attend your wedding, you can note it and send out another batch of invitations accordingly (and of course tactfully in a way that doesn't make any guest feel like an afterthought). You'd have to either be on top of this or hire a wedding planner who is. Putting together your guest list can be overwhelming and bring a lot of pressure. Just keep in mind that anyone who genuinely loves you and wants to be at your wedding, whether or not, they agree with your rules, will respect them, just for you. Focus on making sure that the people you care about the most are around you to witness you take a big and beautiful step in your life. Trust me, on that day, you want to be surrounded by love and support. Everything else shouldn't matter. All in all, take a deep breath, it will be okay.